The seventh episode of “Westworld” Season 2 dropped a bunch of narrative bombs on viewers, even as it packed in a heap of action as the humans and the hosts faced off in a series of deadly battles. While Delores (Evan Rachel Wood) battled Hale (Tessa Thompson) and her army of goons to try to rescue Delores’ father, and Maeve (Thandie Newton) and the Man in Black (Ed Harris) had a big showdown, the spookiest events were happening with Bernard (Jeffrey Wright). 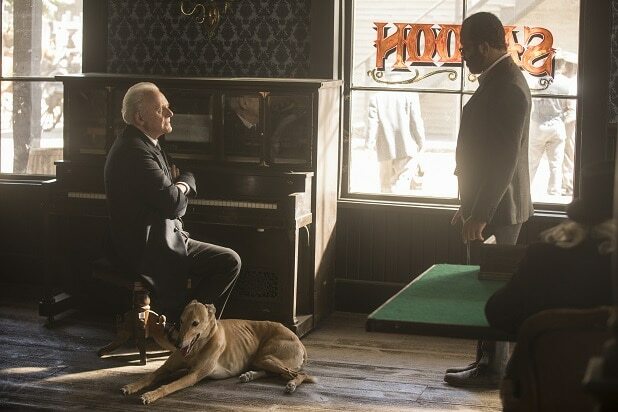 At the end of the last episode, Bernard jacked himself into the Cradle, the big computer at the center of Westworld that contains all the hosts’ personalities. Inside that digital version of the park, he found somebody who was supposed to be dead: Robert Ford (Anthony Hopkins). Ford died at the end of Season 1, when Delores executed him at the start of her robot revolution — seemingly the culmination of Ford’s plans to give the hosts free will. But as Bernard works out and Ford helps explain, the park is actually a big experiment for gathering data on guests in order to copy their minds. As we saw with James Delos (Peter Mullan), the idea was to try to find a path to immortality for humans (and, you know, sell it to them). So Ford’s mind is preserved inside the Cradle as a digital copy, using that same immortality technology. Ford can’t get transferred into a host body of his own, as he explained — like we saw earlier this seasn with Delos, Ford’s mind would degrade in a host body, and he’d start to go mad, because the park scientists never managed to solve that problem. But as long as he stays in the Cradle, Ford’s mind is fine. After that, Bernard exits the Cradle. Soon afterward, the host Angela (Talulah Riley) destroys it, along with all the backups of the hosts’ personalities, and Ford’s mind, too. But later, we see that Bernard is not completely in control — and he’s seeing Ford, who is telling him what to do, and even takes full control of Bernard’s body at one point. It definitely seems like Ford is, yet again, not completely dead. His human body might be gone and the digital copy of his mind might have been destroyed in the Cradle, but now he lives on in Bernard. That raises some major questions about what might happen with Ford (and Bernard) in the last three episodes of the season, and what’s been going on with him in the future timeline we’ve been seeing throughout Season 2. It might be that Ford left a piece of himself or a program he created in Bernard, but it really seems like Ford downloaded himself into Bernard. That would have allowed Ford to both take control of the host, and to live on outside of the Cradle. At the end of the episode, we see in the future timeline that Bernard’s programming is fracturing, and Costa (Fares Fares) remarks that it looks like his software is in conflict inside his head. What we’re probably seeing is two separate programs at war inside Bernard’s head: Bernard’s host mind, and Ford’s human one, fighting for control. One other wrinkle: If the Westworld scientists never figured out the degradation problem, and that really is the digital Ford inside Bernard, then it’s very likely that Ford will start to suffer from the same madness that Delos did. We could be in for a Bernard that’s not just a host, and not just battling against the influence of Ford inside is head, but is now contending with an insane Ford attacking him from within. If there’s anything scarier than Ford and all his machinations, it’s one that’s not fully in control.